Got rid of my other 2 cars, and picked up a CPO 2016 Lexus GS F., of course I had to do a oil sample on it. The cars had Castrol GTX/Ultraclean 5w-30 it's whole life (don't recall when they switched the formula/packaging from regular GTX to the Ultraclean moniker) along with the OEM oil filter. It now has PUP 5w-30 in it now; will most likely do a UOA on that too. This sample saw 6-7 runs at the dragstrip; in addition to seeing the upper RPM range on a daily basis. Looks great, Castrol does a good job! Surprised at how much TBN is left....looks like it could go 10k if someone wanted. Other than that, looks like a really good report! It's like as long as you do regular maintenance on a Toyota/Lexus/Scion they give great UOA's! Doesn't seem to matter what oil, as long as it's maintained..
After 5K miles, it still had 6.6 TBN? Triple, I tested the PP Euro 0W40 in my Odyssey last summer. 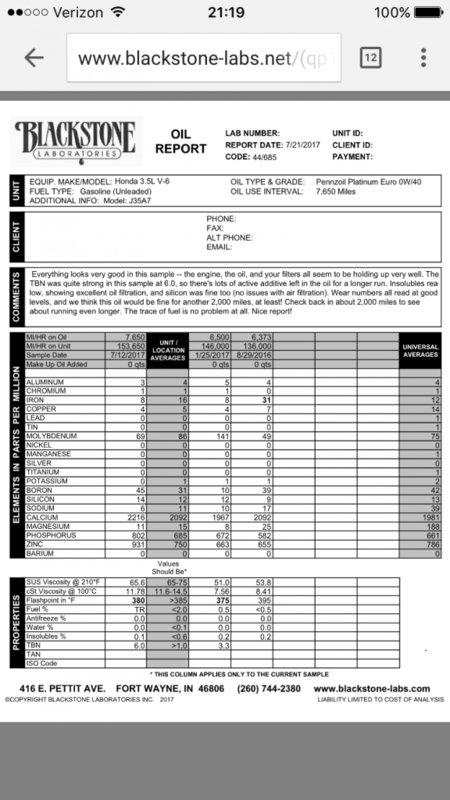 At 7,650 miles, the oil still had a TBN of 6.0. If there is not a lot of fuel dilution or oil contamination, there is less to cause the TBN to be depleted. Odysseys are known to be hard on oil with the iVTEC, so we know PP Euro 0W40 is pretty dang stout! This looks like the SN Plus formulation. Also now labelled a Synthetic Blend on their website. Thanks for sharing, great report. I have to say, I am pretty happy with the results ; although I know you can't compare these vehicles at any level - it was nice to see comparing to my WRX STI UOA's that just hammered the oil put in it. It's driven 60 miles round trip of which 90% is highway. It has a 9.3 qt oil sump capacity - that's allot of additive capacity to deplete. Also for those of you who don't know - this is a port / direct injected engine. I would stick with the Castrol. That engine does well with it. This makes a little more sense now. Last edited by SlavaB; 02/02/19 01:40 AM. Follow the max OCI interval the GTX can handle it at ease in this application. Someone posted on here Castrol can not formulate an motor oil properly. Yes it was someone who has a history of posting other idiotic comments as well.